Trip injuries are extremely common and can result in anything from slightly dented pride and embarrassment to severe and permanent disability. Trip accidents can be caused by any unexpected obstruction in your path – whether that be items that have been placed in such a way as to present a hazard or faulty or damaged flooring. Other common factors in tripping accidents include potholes, cables, hoses, missing or damaged grids, manhole covers or utility company access covers and uneven pavements and steps and stairs. Other factors can increase the likelihood of trip accident injuries such as inadequate or faulty lighting, missing handrails on staircases etc. A tripping accident may result in you coming into contact with the floor surface itself or in some cases falling onto other hazards once your stability has been compromised. Accidents involving trips and subsequent falls are sometimes known as ‘trip fall accidents’ or ‘trip and fall accidents’. Contact someone nearby to obtain help. If you are, or believe that you are more seriously injured then ask that person to call for medical assistance – this could be anything from an on-site first aider (on a business premises) to an ambulance – depending on severity. You may simply have suffered minor bruising as you fell, but as many trip accidents involve a subsequent fall or contact with other objects there is always a risk of limb, spinal or head injuries and so you should seek appropriate attention or seek out someone else to arrange this for you if you are unable to do so yourself. Record as much relevant information as you possibly can, including precisely where it took place and the circumstances leading up to the event itself. If your accident takes place in a business premises then ensure that the incident is recorded adequately in their Accident Book. It is a legal requirement that they possess one of these. Many business premises may also complete additional paperwork regarding the incident – ensure that you agree fully with anything being documented as anything recorded will likely be produced at a later date as they attempt to defend themselves against your trip claim. Do not sign anything if asked unless you feel that it is an accurate representation of events. If in doubt, don’t sign anything that you feel may compromise your case for negligence. If your accident takes place in a public place such as a road or pavement then you should notify your local council. If your accident takes place at work then you should notify your employer and ensure that it is adequately recorded. Some accidents, depending on nature and/or severity must legally be reportable to the HSE or local authority under RIDDOR (Reporting of Injuries, Diseases and Dangerous Occurrences Regulations 1995) which assigns employers and premises operators a legal duty to do so. 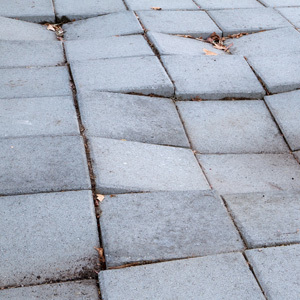 Pavements – paving is a common cause of trip accidents and also a common cause of trip compensation claims against local authorities who have a duty of care to inspect and maintain them. Even a minor deviation in the height of paving stones is enough to present a trip hazard. Even if a paving stone appears to be straight and level it is sometimes the case that they will move when weight is put on them, rocking and causing you to trip over the edge of the adjacent paving flag. If the local authority has not adequately inspected, maintained and recorded their maintenance, or if they have failed to repair a faulty area of paving following notification then they may be deemed negligent and you may be able to pursue a trip compensation claim against them, or in some cases against a contractor who has damaged or incorrectly laid them following excavation. Many councils are opting for tarmac pavements as they reduce the incidence of trip claims against them, although poorly maintained or repaired tarmac pavements can still present a trip hazard. Public Highways – the council or local authority has a responsibility to ensure the safety and adequate maintenance of public highways and if you were to trip on a road as a result of poor maintenance, for example due to a pothole, and the council is considered to have been negligent in remedying the issue in a timely manner or maintaining the road adequately then you may be able to make a personal injury compensation claim in this respect. Even if the council is not deemed negligent you may be able to pursue the person or persons responsible for the contamination that led to your accident – this may be a contractor or a utility company or whoever cause damage to the road in the first place. This also applies to broken or faulty or mislaid manhole covers, access covers used by utility companies and drainage covers such as grids. Retail Premises – often staff are less than careful in their duty to protect themselves, their colleagues and their customers from injury and many retail activities such as restocking shelves can lead to discarded packaging and stock being left on the floor, thereby posing a hazard to others. In this case the business operator would potentially be liable for your accident and the injuries sustained.